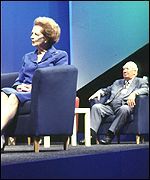 As the 2003 party conference season begins, BBC News Online presents its guide to the key moments from these seaside political gatherings of the past. 1867: Plans for first Conservative conference show early signs of Tory infighting. The National Union of Conservatives, who wanted rally at Crystal Palace and a national conference, is upstaged by the Metropolitan London and Westminster Association. The London activists take over the rally plans, leaving the national union to run a poorly attended conference. Only six delegates went to its second conference late in 1868. 1891: The Liberal Party assembly agrees Joseph Chamberlain's Newcastle programme, which includes promises of home rule for Ireland and industrial accident compensation for workers. This is effectively the first time a conference agrees a manifesto. 1900: The Labour Party is founded by delegates meeting at Memorial Hall, Farringdon, London. 1911: Conservative leader Arthur Balfour bows out after warnings that there would be formal attempts at the National Union conference to have his leadership disowned by party activists in public session. He had probably already made his decision. 1936: Labour's conference platform is bombarded by calls of "arms for Spain" to shore up the republican government. The National Executive Committee's argument that there is no proof that arms were getting through to the rebels there prompts anger. 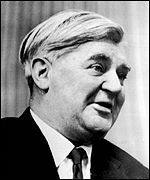 1939: Union block votes at the Labour conference help to endorse by 5-1 the decision to expel Stafford Cripps and Nye Bevan from the Labour Party over their calls for a Popular Front against fascism. 1963:Conservative leader Harold Macmillan's resignation is announced at the conference, prompting a flurry of talks as Lord Hailsham, Alec Douglas-Home and Rab Butler jostle for the premiership. 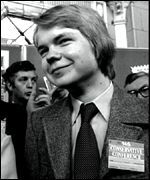 1977: The 16-year-old William Hague makes an impression at Conservative conference, telling delegates: "Most of you won't be here in 30 or 40 years time." 1980: As criticism grows of her premiership, Margaret Thatcher delivers a defining speech, declaring: "U-turn if you want to, the lady's not for turning!" 1981:SDP's first rolling conference takes the train through Perth, Bradford and London. 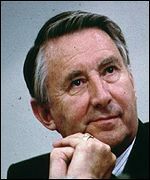 B>1981: David Steel rather prematurely tells Liberal activists: "Go back to your constituencies and prepare for government." 1985:Labour leader Neil Kinnock uses his Bournemouth conference speech to launch a fierce attack on Militant. He raged: "You end in the grotesque chaos of a Labour council ... hiring taxis to scuttle round a city handing out redundancy notices to its own workers!" That prompted Liverpool Council's Militant leader Derek Hatton to brand Kinnock a "liar" from the conference floor. 1987: The SDP's party conference is dominated by the rift over whether the party should merge with the Liberals. Anti-merger MP John Cartwright says: "No ballot gives anybody the right to tell me which political party I should be a member of." 1993: John Prescott helps Labour leader John Smith to win the case for one-member-one-vote with an appeal for delegates to back the man who had "put his head on the block". 1995: Michael Portillo is pilloried after in a speech about Europe, he says: "The SAS have a famous motto; 'who dares, wins'. We dare, we will win." 2000: Conservative shadow home secretary Ann Widdecombe's call for a tougher line towards cannabis users goes up in smoke when shadow ministers say they have experimented with the drug in the past. 2002: Tory chairman Theresa May tells fellow Conservatives that they must move on and shake off their tag as the "nasty party".